Fatigued, Anna decided to wash up before settling down to sleep. Walking towards the bathroom, she stopped for a moment in front of her dresser and opened the bureau drawer. Anna selected a white cotton chemise, pulled it on and paused to brush her long, blonde hair. She moved into the bathroom and stood, looking into the mirror above the sink. She stared at herself. With her finger, she traced her lips. She gazed at her reflection. An overwhelming sense of responsibility and loneliness took over as the tears flowed freely down her face. She whispered softly to herself, “There is only Britta that I can trust.” She turned off the light, her image fading as the light left the room. She awakened later that night with a start, perspiration clinging to her white cotton chemise. Anna had yet another dream of moonlit rituals that was shattered by an overpowering bolt of fear. What am I so afraid of? she thought as she looked over at the journal on her night table with a five-star picture on the cover. 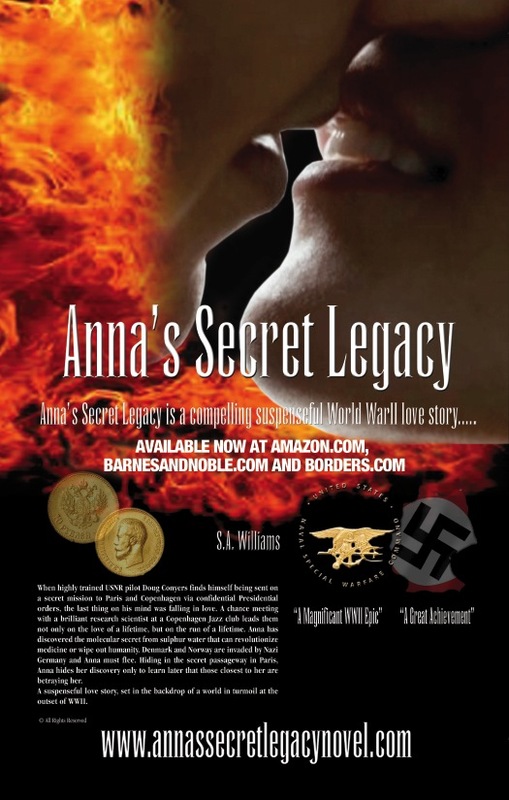 This entry was posted in Anna's Secret Legacy Blog, Book Blog, Love Affair, Scientific Discovery, Uncategorized, World War II. Bookmark the permalink. ← Main Line News Article on Anna’s Secret Legacy!